That is the feeling of near death and having your friend physically drag you across because you thought you were going to die. I'm serious that finish line was more relieving that child birth. Colleen is amazing. We started running around the same time and when I say she really stuck to it...I mean she really stuck to it. We both started not being able to run a whole mile without stopping and she's now running 8/9/10 miles at like a 9:00 pace. Ridiculous. And so amazing. I seriously could not be more proud of the girl. 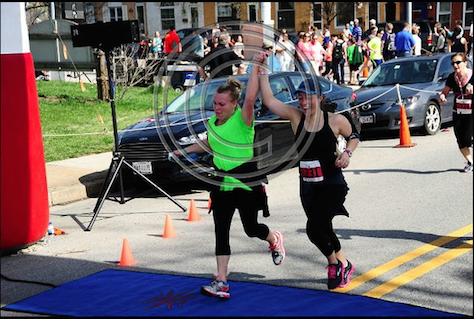 She found a Groupon for a 10k that was in Baltimore, with gorgeous views and I was all "Yeah, let's do a 10k!" Not thinking about what I was actually saying. My husband of course would not do it with me, and her husband is obviously of Kenyan descent because he finished in a very speedy manner. so I signed up and Colleen promised to run next to me even if she had to drag me. Which as you can see from the photo she pretty much had to do at the end. The first four miles I would say were pretty awesome. It was also the first time I didn't run with my music in the ear. And it was amazing. It was nice to talk when we wanted and take it all in. Then after around 4 miles my old geriatric problems started and my hip started hurting, but worse was my knee pain. Since playing basketball in my younger years I've always had a weird knee that would get sore from time to time, but never serious. This was awful. I seriously felt like my leg was going to fall off and my knee throbbed with every step. But I knew if I stopped.... I wouldn't start up again. So I kept going. And praise moscato, it actually went numb around mile 5. 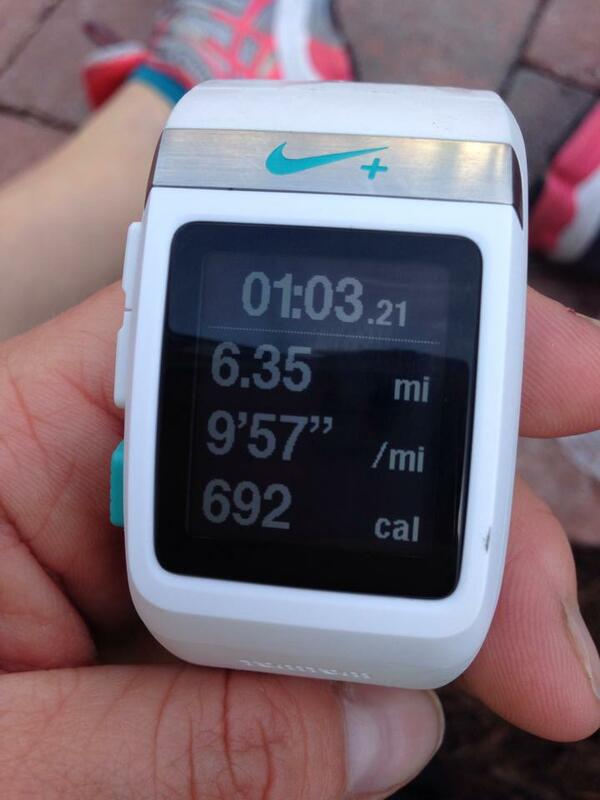 And Then miles 5-6.2 were utter "I am going to lie down and die in the streets of Baltimore." But I did it. And I swear to you if Colleen hadn't been right next to me, I would have walked that last mile probably. Which just goes to show me that I really need to work on mentally pushing myself. But we finished! And though I am completely positive that I slowed Colleen down quite a bit....I think we did pretty well! Needless to say I was more excited to get to the table of bananas and food than anything else. Would I run another one? Absolutely. But I think I would try and prepare myself a little better. Aka actually put in the effort to run during the week. So thank you my sweet baby angel Colleen. And I might even be cray enough to try a half with you!